Rosscairn was built in the mid 1880s for a wealthy merchant and his family and although modernised over the years the building still retains many original features such as marble fireplaces and ornate cornicing. 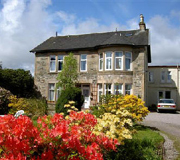 For more than 50 years it has been run as a small Victorian house hotel. Owned and operated by Alec and Lynn Jones and their family since 1988 this independent 3 star small hotel offers spotless accommodation. Quiet well appointed en-suite rooms, most with picturesque views over the adjacent Cowal golf course and surrounding hills, offer guests a chance to unwind and relax during their stay. For the nature lover and observant visitor there is an abundance of wildlife to be found in the magnificent lochs and glens. Look to the hills and there is every chance you may see roe and red deer, red squirrels and a variety of bird life including large birds of prey. Seals, porpoises and dolphins along with many different breeds of waterfowl are often to be seen in the clear waters of the Firth of Clyde and basking sharks are frequent summer visitors. We offer a warm and friendly welcome, comfortable clean accommodation, excellent home cooked food and a peaceful atmosphere. Come and stay with us for a while, relax, unwind, enjoy our hospitality and like many others return as friends.